Beautiful bottles of skin care products sit behind glass cases and on shiny countertops being advertised by sales associates in high-end retail stores across the United States. High-end, skin-care products can be great investments, but drug store products can be just as effective. There are two important things to know when it comes to caring for one’s face. One, be aware of skin type, and two, drug store skin-care products can be just as effective as expensive, high-end products. ducts containing glycolic acid to once a week. Aveno products are ideal for taking care of this type of skin and can be found at any drug store. A common misconception is that drying out one’s skin will clear acne Utley said this will actually cause more breakouts. “Acne treatments with five percent benzoyl peroxide can be used once a week,” Utley said to prevent over-dryness. Clearasil and Clean & Clear are good lines to use to treat acne skin, Utley said. Those with sensitive skin should use products that provide nourishment, such as a gentle cleanser that will not irritate the skin. Utley recommended the Cetaphil line. ten by dermatologists that suggest products that don’t have $100 price tags and can be found at the drug store,” Utley said. If a person is confused about what his or her skin type is or is using products that are not treating their skin, it can make the matter worse. Seeking help from a licensed professional should be considered. 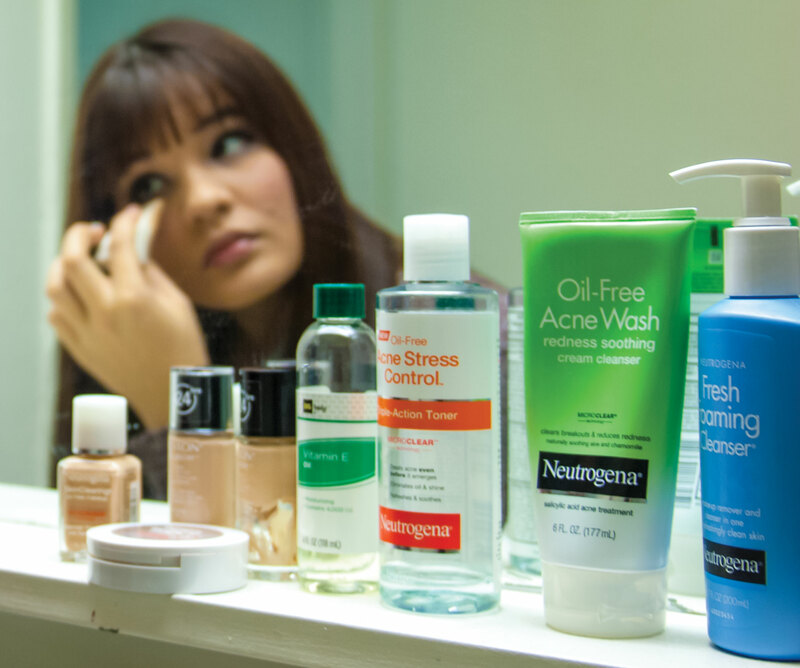 Lauren A. de Encio, sophomore psychology major, sought medical attention from a dermatologist after having problems using different product lines. Skin ID, a line made by Nuetrogena, even left her scars. De Encio now uses prescribed products from her dermatologist. While seeking professional help and using prescribed products is not necessary for everyone, it is a good thing to consider if problems persist.